U.S. Medium Tank M4A3E8 Sherman "Easy Eight" w/ T66 Tracks. For several decades, it seemed that kit manufacturers had their attention focused solely on German military vehicles of the Second World War. In the 21st century, however, we have seen more variety in new releases, with the trend toward Allied and Modern subjects accelerating noticeably in the last few years. Tasca has been a classic example of this trend. Following their initial releases of the German Pz.Kpfw. II Ausf. L Luchs, the main focus of subsequent kit releases has been a standard-setting series of Shermans. 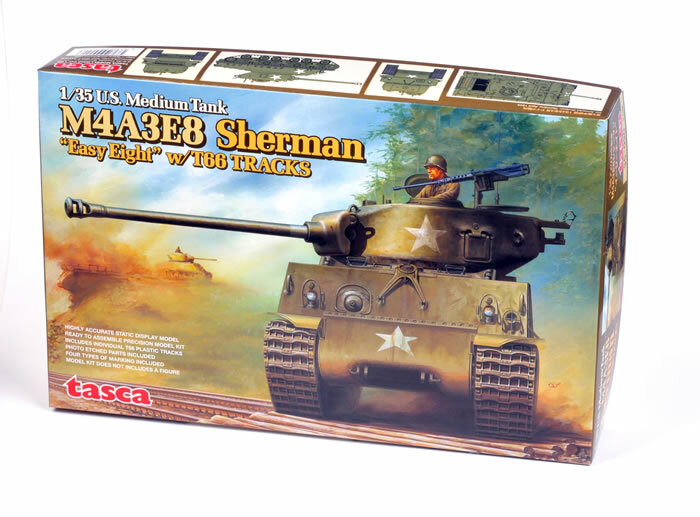 The latest in Tasca’s Sherman line is the M4A3E8 Sherman “Easy Eight” with T66 Tracks. The M4A3 was the first Sherman variant to feature HVSS (Horizontal Volute Spring Suspension) as factory fitted equipment. HVSS suspension was equipped with wider tracks to distribute weight more evenly. These wider tracks allowed more armour to be fitted and offered a more comfortable ride for the crew, but also required narrow track guards to be fitted to the sides of the hull. With its experimental E8 designation, the smooth ride of the HVSS led to the nickname Easy Eight for this Sherman variant. The M4A3E8 first entered service in Northern Europe during December 1944, and the variant continued in the front lines post-war, including service in Korea. 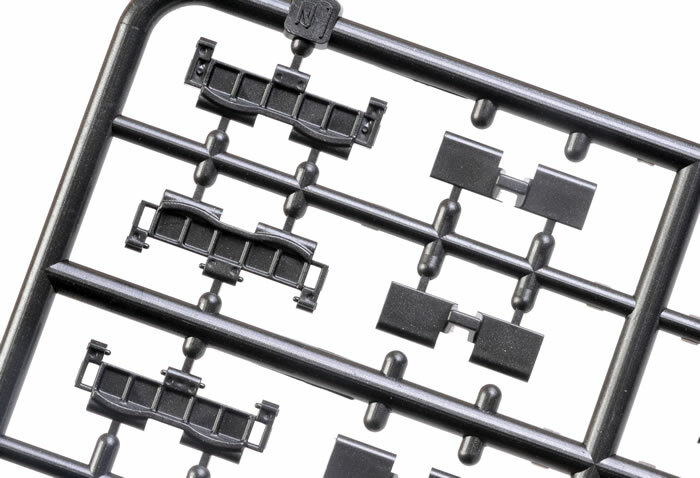 The new kit comprises around 500 parts in dark green plastic, 280 parts in black plastic, 16 parts in clear, 24 clear polythene caps, a photo-etched fret and markings for five vehicles. Tasca’s 1:35 scale M4A3E8 delivers quite a few significant firsts to their Sherman series. 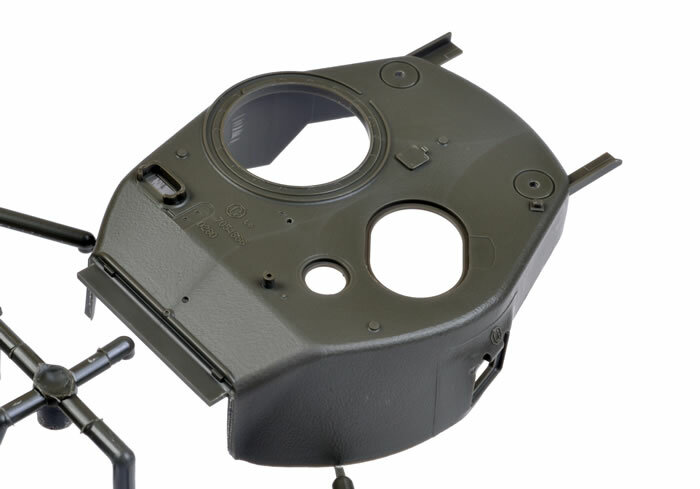 There is a new variant of the T23 turret with the oval loader’s hatch and subtle cast texture. The running gear includes the later Horizontal Volute Spring Suspension (HVSS) suspension units, and workable two part individual link T66 tracks. This is a bit of a change compared to the flexible length tracks provided with Tasca’s VVSS Shermans. 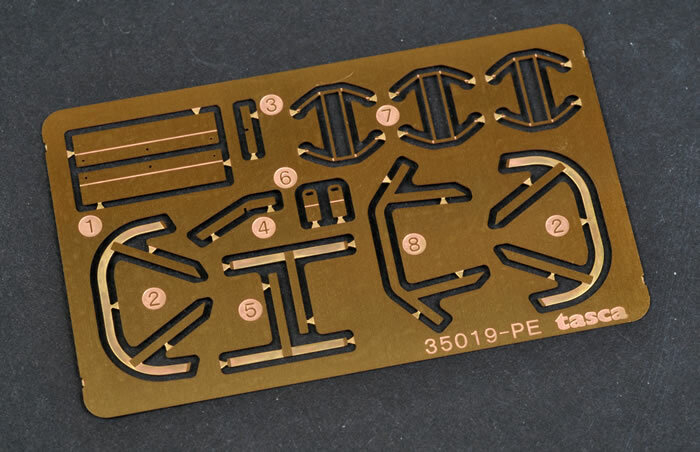 Each part is attached via three fine sprue connectors, and the only ejector pin circles are on the inside mating surfaces of the links, so they will not be visible when assembled. 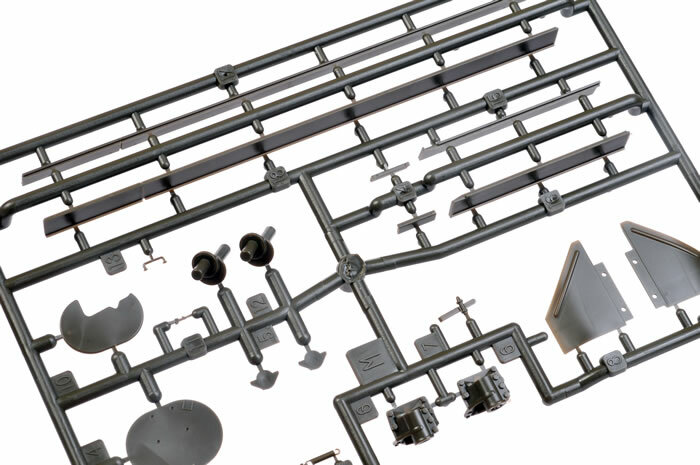 Each HVSS unit is made up from 17 pieces, and will be articulated when assembled. Note that the idler wheel mount, parts M12, are also workable track tensioners. 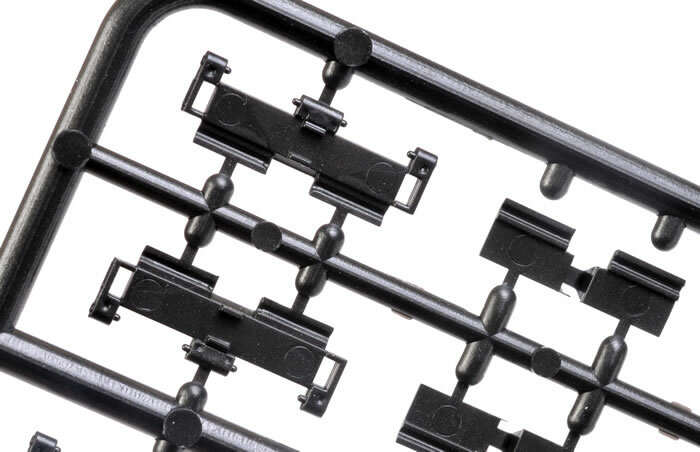 Do not glue these parts in place, as you will need to swing the arms to tighten the track when it is installed. All of the other key features of the M4A3E8 are depicted too, including the 47° glacis hull with the enlarged hatches, the correct rear deck configuration, two styles of 76mm gun barrel, plus an optional muzzle brake. Appliqué armour is not provided. The clear Commander’s cupola is offered as an option. 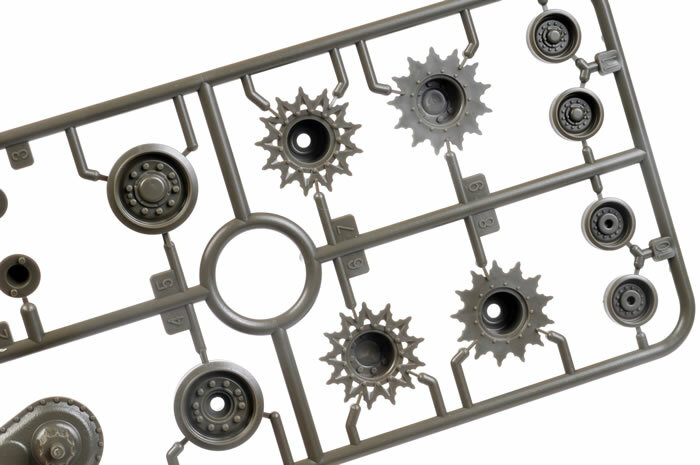 This is ideal for modellers who want to mask off the vision blocks for a very realistic result. For those who prefer to paint their vision blocks, a solid green plastic cupola is also supplied. Periscopes and light lenses are provided as clear parts too. The lower hull is made up from Tasca’s familiar “flat pack” arrangement of separate floor, sides and interior bulkheads. The M2 .50 cal machine gun has been seen in earlier releases. This is a little gem. The .50 cal may be mounted on the cupola or stowed on the back of the turret. Jerry cans are supplied too. The modest photo-etched fret includes brush guards for the lights and periscopes. Five marking options are provided for U.S. Army vehicles in northwest Europe from February to April 1945. All five are finished in overall Olive Drab. 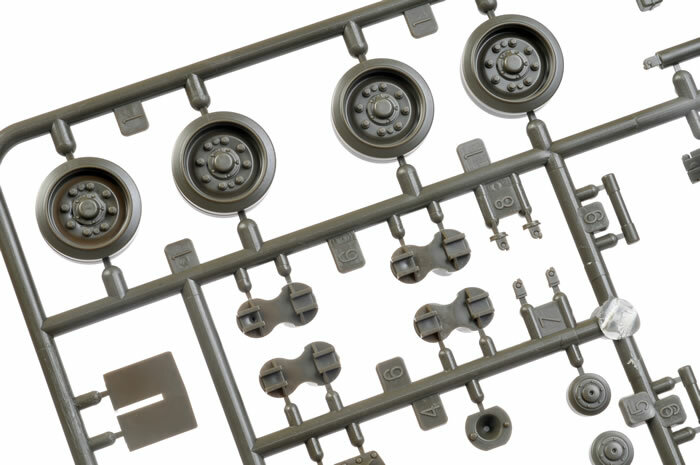 Tasca continues to work its way diligently through the major variants of the M4 Sherman. Their 1:35 scale 1:35 U.S. Medium Tank M4A3E8 Sherman “Easy Eight” with T66 Tracks is a wonderful example of the model manufacturer’s art. 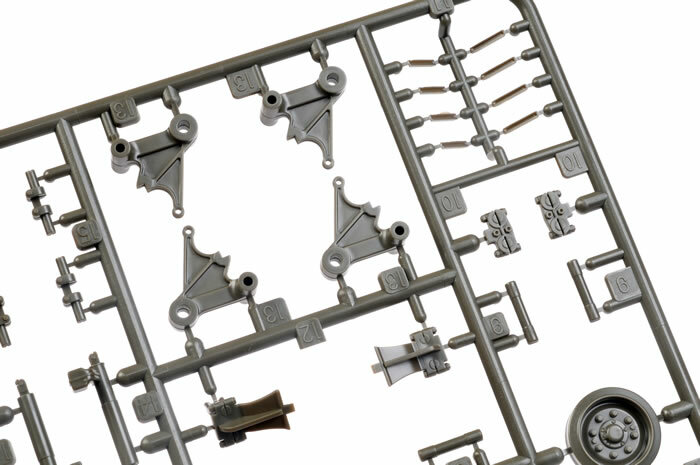 With more than 800 parts, this kit will demand some time and attention but, if earlier Tasca releases are anything to go by, there should not be any traps for the unwary modeller. What will Tasca tackle next? Roll on down that Sherman road!